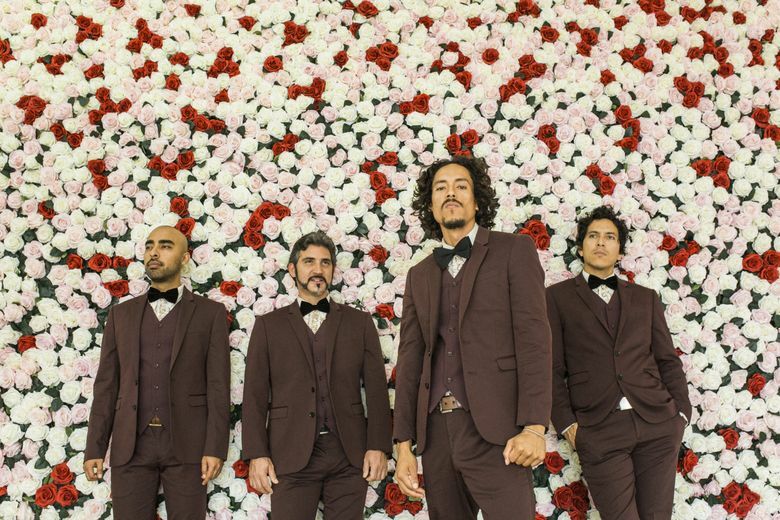 With heavy bass in the backdrop, a funky organ highlight and guitar riffs that jump between ’60s oldies and ’70s psychedelic, Chicano Batman, who plays The Showbox Nov. 18, wormholes you into the past while making Latino identity relevant in the indie and alternative scene today. With heavy bass in the backdrop, a funky organ highlight, plus guitar riffs that jump between ’60s oldies and ’70s psychedelic, Chicano Batman wormholes you into the past while making Latino identity relevant in the indie and alternative music scene today. The band’s 2017 tour will come to a close in Seattle on Saturday, Nov. 18, at The Showbox. The tour kicked off in Seattle back in February with a sold-out show at The Crocodile and the band has since headlined this year’s Bumbershoot and Sasquatch festivals. 7:30 p.m. Saturday, Nov. 18, The Showbox, 1426 First Ave., Seattle; $20.50-$22 (888-929-7849 or axs.com). But beneath the groovy tunes of the album bubbles the band’s experience of being Latino, which pushes to the surface. “The name Chicano is an identity in the Southwest and it just means an acknowledgment of one’s Mexican-Americaness,” says guitarist Carlos Arévalo. All four members of the band have roots south of the border. Arévalo’s mother is third-generation Mexican American and his father is from El Salvador. Their musical influences include bands that many who grew up with Latino parents may recognize, from the ’60s Chilean band Los Angeles Negros to the Peruvian band Los Pasteles Verdes. Beyond musical Latino inspirations, their music also showcases certain experiences that are unique to people of color living in places like L.A.
For fans who don’t understand Spanish, without looking it up online, it would be impossible to know that the song “La Jura” is a song about police brutality. The term “la jura” is slang for law enforcement. Written by Eduardo Arenas, it describes the night he saw an unarmed Latino teenager get shot by a police officer. “I don’t understand / the ones who are supposed to protect / do the opposite / killing the innocent,” the song’s chorus states. While the new album titled “Freedom is Free” was released earlier this year, its creation started in 2015 and was never meant to be in any way political. “We were just writing about what was going on around us,” says Arévalo. Another song channels a spoken-word style reminiscent of The Doors’ frontman, Jim Morrison. The song directly calls out capitalism, globalization and colonialism in one swift and smooth voice. All it’s missing is some finger snapping at the end, but surely Seattle will do that and more at the show later this month. Agatha Pacheco: apacheco@seattletimes.com. Twitter @AgathaPacheco.